Unique among todayʼs leading philanthropists, Mike Bloomberg has run both a multi-billion-dollar company — Bloomberg LP, a technology company he founded in 1981 — and one of the worldʼs largest cities. 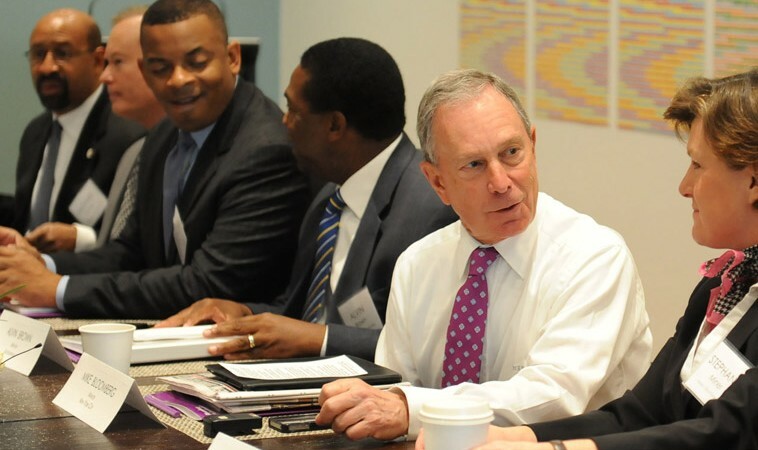 His entrepreneurial spirit, public-policy experience, and belief in the power of cities to drive solutions to pressing global problems define Bloomberg Philanthropiesʼ approach to making the world a better place. Bloomberg Philanthropies focuses on five key areas for creating lasting change: public health, environment, education, government innovation, and arts & culture. These five areas encompass the issues Mike Bloomberg and his team are most passionate about, and where they believe the greatest good can be achieved. While Bloomberg Philanthropies works on a wide range of issues within each focus area, we apply a distinctive approach to all of our undertakings. Mike Bloomberg has always been attracted to challenges where the potential for controversy or failure keeps others at bay. That approach comes from his entrepreneurial instincts and his belief in leading from the front, regardless of popular opinion or special interest politics. See how we are confronting the coal industry and accelerating the transition to more sustainable energy sources. Spreading effective programs, policies, and strategies to other jurisdictions can accelerate progress on a broad range of issues. For example, our tobacco control initiative focuses on advancing interventions that are proven to help curb tobacco use and save lives. Since we began spreading these effective solutions in 2006, 60 countries have passed comprehensive tobacco control laws, protecting an additional 800 million individuals against the harmful effects of tobacco and saving 4 million lives. Bloomberg Philanthropies applies this approach in all five focus areas, helping to turn proven ideas into widespread solutions, and tailoring them as needed to scale up their impact. Read more about how we are saving millions of lives by spreading solutions proven to curb tobacco use. Using data in new ways helped Mike Bloomberg transform the way the financial industry operates by bringing transparency to markets around the world. It also enabled New York City government to leap to the forefront in providing open data and promoting public sector accountability. Bloomberg Philanthropies is committed to harnessing the power of data to assess opportunities, measure progress, and evaluate impact and improve performance. See how we are using data and evidence to improve decision making. Writing checks isn’t enough to achieve lasting and necessary change. Often, that requires empowering individuals and organizations to advocate for themselves. At Bloomberg Philanthropies, we help organizations be effective advocates in swaying both public opinion and government officials in order to shift policies and advance progress. Learn about how we use advocacy to drive important education reforms throughout the U.S. The challenges we face in America and around the world are increasingly complex, and neither the private nor the public sector can solve them alone. Public-private partnerships were a hallmark of Mike Bloombergʼs approach as Mayor of New York City. Bloomberg Philanthropies takes a similar approach, bringing together people, ideas and resources from across sectors toward a common purpose and amplifying their impact. Discover how public-private partnerships can be used to support the arts. The change that happens in cities can change the world. Cities are the global centers of communication, commerce, and culture. And whether it is facilitating the spread of good ideas between cities to help mayors tackle some of their toughest challenges, or leading a global coalition of large cities to take real action against climate change, Bloomberg Philanthropies leverages the power of cities to create lasting change – especially when national and international bodies refuse to act. Find out more about how our efforts to address climate change on a local level are having a global impact.